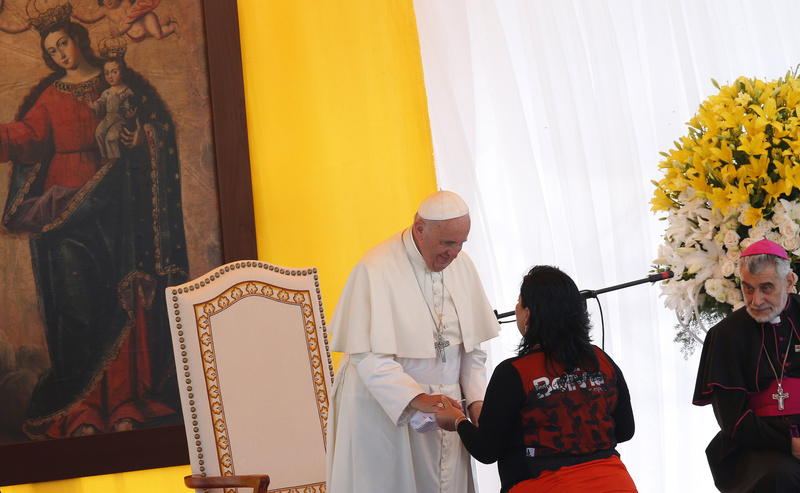 “Dear Brothers and Sisters, I could not leave Bolivia without seeing you”, Pope Francis told thousands of inmates and their families in a prison 15 km outside Santa Cruz on July 10, before leaving Bolivia and flying to Paraguay. The prison of Santa Cruz-Palmasola – known as an “education center” - is home to some 4,000 prisoners: women (many with children), men and young people, detained indifferently for very serious and petty crimes, many of them waiting a long time before their cases reach the courts. But here, in this city within the city, many inmates can receive daily visits from their families, and family members can even stay with them. As archbishop of Buenos Aires, Bergoglio visited prisons frequently, and one on occasion he spent a whole night inside a prison talking with some inmates. He has continued that practice since becoming Pope, and has visited prisons in Rome and in Naples - where he had lunch with the inmates. It’s also known that as Pope he has phoned a few inmates he knows in a Buenos Aires prison. Knowing his concern for them, prisoners from all over the world write to him. His decision to visit the Palmasola prison sparked great excitement and enthusiasm, not only in the prison but also in the surrounding area of Santa Cruz. Thousands gathered both inside and outside the prison waiting for him to arrive. They applauded and shouted with joy when he arrived in a small Fiat Idea car, with his window rolled down, waving to them. Inside the prison he met several thousand people in a big open-air recreation ground, including inmates, their family members, as well as prison staff and guards. Seated on a platform in front of them, he listened attentively as three prisoners told their life stories and related how they ended up here, deprived of their freedom. One of them – a young man – welcomed Pope Francis not only in the name of the inmates here, but also “in the name of all the prisoners in Bolivia.” The inmates applauded enthusiastically; they greatly appreciated that the world’s leading moral authority would find time to be with them, with those that society has branded as criminals. Another young man denounced what he called “the judicial terrorism” in Bolivia, where justice is a very slow process and many wait in prison for a long time before being brought to trial, and never know when they might regain their freedom. A young woman prisoner spoke about the plight of women inmates who are pregnant, and suggested that there should be an ‘indult’ for them. Francis listened attentively, and embraced each one individually. Then he began speaking, and told them: “I could not leave you without seeing you, without sharing that faith and hope which are the fruit of the love revealed on the cross of Christ.” They cheered very loudly. The Pope’s prison visit calls to mind a story about Monsignor Hugh O’Flaherty. For ten years after WWII, prison inmate Herbert Kappler received a monthly visitor, always the same visitor, Monsignor Hugh O'Flaherty. As Nazi SS commander in Rome, Kappler had made numerous attempts to assassinate Msgr. O'Flaherty. The monsignor was credited with saving the lives of over 3,000 Jews during the Nazi occupation of Rome.